David Dreman author of "Contrarian Investment Strategies: The Next Generation" I'll bet on Ralph Wanger's zebra! His book is witty, a fast read, and above all makes excellent investment sense. The renowned, iconoclastic head of the Acorn Fund shares his profit-maximizing, risk-minimizing investment advice in a book as irreverent as it is smart. When "USA Today" asked a group of prominent professional portfolio managers whom they would choose to manage their personal wealth, the person most often cited was Ralph Wanger (Warren Buffett came in second). Hailed by both "Newsweek" and "U.S. News & World Report" as the "dean" of small-cap investing, Ralph Wanger explains the principles of investing in small, rapidly growing companies whose stocks will yield well-above-average returns. Investors are like zebras in lion country: They must settle for meager pickings by sticking in the middle of the herd, or seek richer rewards at the outer edge, where hungry lions lurk. Wanger shows investors -- whether they are investing in mutual funds or buying stocks on their own -- how to achieve the right balance of safety and risk to survive and prosper in the investment jungle. 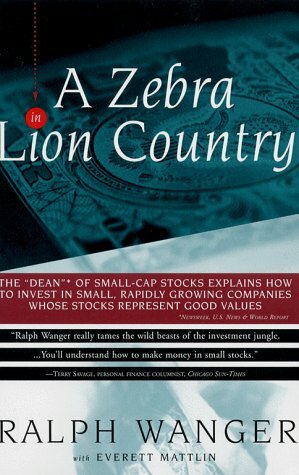 Destined to become a classic in the field of investing, "A Zebra in Lion Country" is as entertaining as it is instructive.